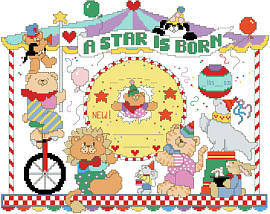 This circus announces your baby’s arrival, with all the details you want to share with family and friends. 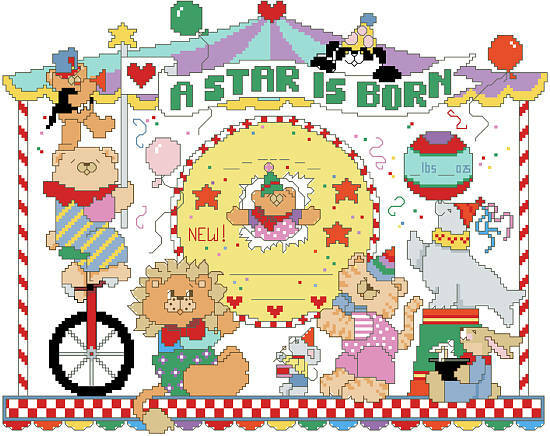 This design features fun little bears, a seal, a panda, a mouse, and a bunny. Suggested colors are easily changed to match baby's room decor. Chart included for letters and numbers. Contents: Stitch Count 175w X 139h on 14 ct, finished size 12-1/2" X 9-7/8"